Fencing provides good physical exercise, employing practically every muscle and totally absorbing the mind. The need for coordination, concentration, self-discipline and control of the emotions makes fencing especially beneficial to young people as an education for life. The social aspects of the sport should never be disregarded; it is equally appealing to men and women and to all ages and abilities. From the duelling age where skill and finesse counted as highly as deadly intent, the modern sport is about technique rather than sheer strength. There is no need to hack off your opponent’s limbs, and with proper training anyone can learn to fence without causing injury. It makes fencing one of the few sports where men and women can compete on equal terms! 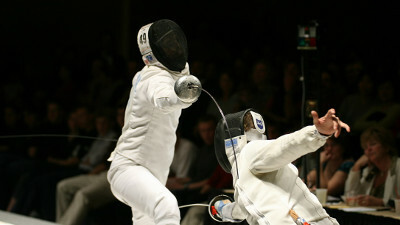 Find out about the rules of sports fencing: how bouts are fenced. A high standard of qualified coaches. In defence of the sport’s excellent safety record, there is a set of standards for fencing equipment, in both make and materials. Any authorised fencing club should be able to lend beginners the full set of protective gear; namely, a jacket, glove and mask. Three weapons are used in today’s fencing, each derived from its more lethal ancestor. The foil – a light, flexible weapon, based on the smallsword. Only hits with the point can be scored. The target area is the trunk of the body. The épée – a stiffer, heavier blade – a direct descendant of the duelling rapier. Again, only point hits are valid, but the whole body is the target. The sabre – a lighter, flexible version of the cavalry sword. Hits may be scored using edge cuts or point thrusts. The valid target for sabre is everything above the waist. In training and in practice bouts, fencers are relied upon to concede the hits they have against them. In competition, where more impartial judgement is required, additional equipment is needed. In competition, fencers wear bodywires which enable hits to register automatically on an electronic box. This shows a coloured light and sounds a buzzer indicating which fencer has taken the hit.